How can you start a side business or side hustle that earns you extra money and helps you achieve financial freedom faster? Starting a side business can be a great way to increase your income and also move you towards financial freedom faster. 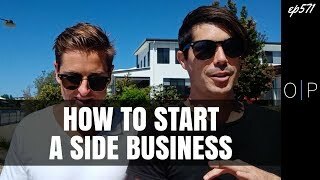 So in this episode we want to talk a little bit about how we started side businesses and side hustle, the side hustle that eventually became both of our full time Gig and lead to financial freedom for both of us and how you can start your side business and your side hustle as well. So can I actually braided your first side business? Actually work because mine didn’t. No, definitely not. I think I first discovered side business when I was in high school. So last year of high school and or maybe in selling lollies shape man. No, I think actually it was the first year after school I learned about how people make money online by having websites. And so my first side business was I created a bunch of blogs but then I didn’t know what to write about and so I stole content from other people’s websites and put it on my own website and got zero traffic and made zero money. Visionary. Can’t copy and pasting Cagle cagle smart. Yeah, exactly. So, but in, you know that at the time, and so yeah, so my first side businesses or the blogs that I started made zero money and I think I dabbled in that for a year or two before I made my first dollar in and we’ll actually set up a lemonade store last weekend with my kid is their first lemonade store. We walked up to the raid, the shop at the end of the straight, got some like cheap bottles and got some ice, went back by handmade this signs and then we just set it up next to the beach and we got six people. We only did it for half an hour because they got bored. It costs us $11 and six people bought drinks. May Have Five, $5 loss on the store, but, you know, like they’re four and six years of age. And I think like the lemonade store was the first little thing that I did when I was a kid. And then fast forward at university, um, I got my first little side business was um, I was really into business and sustainability at that time. And so I want some grants of the Queensland government in my third year of university to $10,000 projects where I actually helped businesses reduce their carbon footprint and save on water and stuff like that. And that’s pretty cool. And that was my first taste of a side business and I was like, so did you actually make any money from the business or you just got grants from the government and they paid you to help businesses, you know, to $10,000 grant. So the whole business model was just when to grants and then figure out a way to deliver. Because I had, I’m pretty sure they just gave me the grant because I was young and motivated and everyone else asking for them was like 50 years of age. So I just got what you had to do is go get 20 businesses to sign up with you and then you could use those business names to apply for the grant. So how’d it go? And door knock and find these businesses say, hey, I’ll help you save some money on energy and water. Um, and then I submitted that grant and that was my first taste of a way to make money on the side because at the time I was still working at like noodle box in and cleaning rooms at a hotel while I was at university still. And that was, that was cool, like $20,000 in the first year from doing something that really only took me in terms of total time, maybe a month to complete like those really it was my first taste of big chunks of money. One of my other side businesses was taking my savings at the time, which was like 500 to a thousand dollars and buying USB sticks from China to resell on Ebay. But I’m gay. No, there were duds. I got sold on that and I didn’t work it out until I had already sold something on Ebay and then people started complaining about them. And so that was usb sticks that were made to look like 32 Gig, which was the biggest usb stick at the time. So when you plugged it in, it looked like a 32 GIG USB stick. But it was only like one gig and so it will overwrite data more than like one gig on there and so there were dodgy. So I basically spent the money on them, which I couldn’t get back because you have to like send it through Western Union and there’s no refund, like there’s no paper, 30 day money back thing. And then I had sold them on Ebay, which I had to refund. So then I had all these Ebay fees to pay as well because I just thought, well that does. I’m just going to refund everyone that I sold them to it. I’m like, don’t post it back to me because I don’t want to pay for post it back because it’s a dad anyway. Just keep it and here’s your refund. But I think looking at side businesses, realizing a big lesson is that money is just a representation of value. So when someone gives you money, you’re giving them value in return. So they’re, they’re giving you value and you’re providing them with value. So they’re giving you value in terms of cash, in terms of money. You’re giving them value in terms of a product or a service or something that you can do, so I think the easiest way to start a side business is to say, well, what is valued that I have that I can give to people in exchange for some sort of money and why way to identify what value you could give them. Market is simple. There’s two questions you asked yourself. The first one is, what am I naturally a little bit better than most people at? Yes. Secondly, what do I enjoy doing? And if you stack what you enjoy doing with what you are naturally a little bit better than or more experience with someone with something that’s actually marketable that you can take to the marketplace. It is crazy how much more money you can end in your daily rate or your alley, right at work, from actually packaging those two things together because the reason it’s important to have your, your side business is something you enjoy is because business is hard. That can be really good days, really bad days, good months, bad months, and if you don’t enjoy it, you can’t persist for long enough to actually create something that’s many. Yeah, and there’s so many uncomfortable things you have to do in business, like you going door knocking for the grants, like I can’t imagine that was a great time dude. I knocked like 70 doors and like people would. I think people just felt sorry for me and that was the first time actually realized the power of influences because my first grand I door knocked on these doors and got all these rejection. My second grant I just went to one person who had 20 businesses under their control and I say, can I help you do this? And he said, absolutely. And so I realized one influencer or one powerful relationship is more important than 20 little ones. Yeah. And so I think while ideally you want something that you enjoy and you love, there are also opportunities in your life where you can see value or there’s value arbitrage. Like Gary v at the moment has a show called trash talk where he goes to garage sales and he’ll buy stuff sounds for like adult law or like $5 for a Lego set and then he’ll flip it and sell it on Ebay for 25 bucks. And this dude, this dude’s like multimillionaire has hundreds of millions of dollars, nearly a billionaire and he loves going to go south and stuff. He did with the pins now. Oh yeah, I saw it on instagram. I didn’t actually watch that episode. So funny man. But that’s the thing. Something like that where you’re buying something from the guy. So if someone’s selling for a buck because they can’t be bothered listing on Ebay or Gumtree or facebook marketplace and you can then go and sell that. Like I got a friend who bought some clothes from the states and then wore them for a bit and then ended up selling them on facebook marketplace for more than they bought them for 100 percent. So there’s opportunities they can do there because it’s not. It wasn’t a brand name clothes, but they were really nice. And so, you know, so there’s opportunities in those sorts of things. Obviously there’s businesses like knowing people’s lawns or being a handyman or there’s so many different opportunities where you can add value to people’s lives and start doing that. The thing that I did after I figured out the, the grants with the Queensland government was I had a passion for sustainability and so, you know, I’ll also wanted to learn how to sell. I think selling is one of the most important skill sets you can have as a business person and a lot of people have thoughts around selling and sales people, but you cannot exist in business medium term if you can’t sell. Yeah, I think it’s the number one skill set you can have outside of marketing that’s the most important for long term sustainability in business. And so I started to sell solar on the side as a contractor for a mate of mine who was running a company and we ended up installing quite a few solar systems and that became what was a part time job into an actual full time job after university. And that was my first opportunity to really do something differently and um, you know, start that business in that way. And then after that, you know, I realized I didn’t want to be in solar and I’m wanting to be in the construction game. So I took a huge pay cut to go back to normal wages for someone else. And in a nonsales role, I was a marketing manager at that time because I wanted to build that skillset for the future. And so I started on the side at night a social media marketing business where, you know, I ended up getting about $700 a week of cashflow from a bunch of little businesses where I was living in, you know, that was a nice little supplement outside of my full time job that, you know, are really just outsourced to other people that I knew, which ended up putting me in a net position of about 20 grand a year. And that 20 grand a year every couple of years was enough to buy another property type thing. Yeah. I think the biggest mistake that I made in my first side business with the USB sticks was investing everything I had into the business, which wasn’t a lot at the time. Like it wasn’t a lot to invest a thousand dollars. Right? But that was all I had insight things and the problem with doing that was when that business filed, that made it hard to just go again because I had like sucked myself of all my savings so I couldn’t go again. So I think the next side businesses that I started with very, they required very little monetary input but more work. And so I feel like that if people are worried about risk and stuff like that, there’s ways that you can make money without putting in a lot of money. You don’t have to buy stuff and sell it. You can use your expertise that you have, as Ben said, something that you’re better at than the average punter. Taking that and then getting jobs doing that. I think with a side business, you’ve got to realize that you’re trading your time for money. Um, whether it’s a product, whether it’s a service, whether it’s scalable or one to one, a side business is always going to be your time and I think when you’re particularly at the start of your career in the first maybe five to 10 years, you’re in a much better position financially and from a lifestyle perspective to invest into a side business and hopefully turn that side business into maybe a full time income. This is, as you get more children, more dependence, more property, you know, a house, a car or you get hooked into that corporate thing where your wages just good enough to not leave. It can be really, really difficult to prioritize time. You know, all of those hours. You and I spent at nights on weekends building these side businesses will just pimps effectively. We’ll just trading time for money. But at the time I didn’t value time valued money, so I was chasing the money. Whereas now it’s time for us if we’re putting it on business. That’s time with our kids. Tom was sacrificing. Time is a commodity. Money is just what we get for trading the value we offer. But I used to use spare time, like I would be going to work and catching the train and I would take, I think I had an ipad with me at the time and so I would write articles for on property which was then cashflow investor. I would write those on the train on the way to work and the way home from work on an Ipad, which was not the easiest thing to type on the format on and stuff like that. So the first articles that I ever wrote, which is still out there and still people still visiting and reading today still makes me some money. I wrote on the train to and from work. That’s awesome man. You know, you know, I, I didn’t do things as smart as he did. I think I always, always, always a bad back then chasing the big cash quick. Yeah. 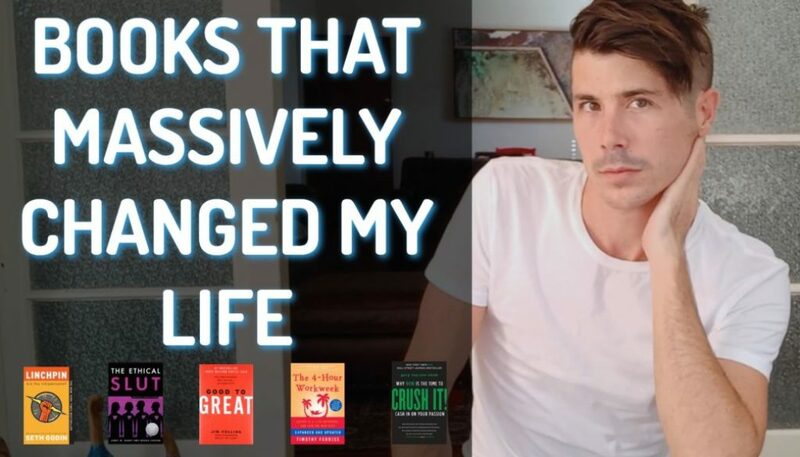 And so I did things or I could make an extra 20 grand or 40 grand or $5,000 in a day as opposed to doing the more sustainable long term lifestyle thing. And I think over the last five years since I’ve met you, you’ve taught me a lot about that and it has slowly moved into my life now that I have other people that do a lot of the heavy lifting in my businesses for me. Um, but you know, the chunks of cash work good because it did enable me doing investing assets, property and buy my own home and things like that a lot faster. So I’m grateful. I just think looking back, there’s a lot easier ways with the right skills. You know, I was just, I had a sales skill sets, so I suppose I went one to one where you had a marketing skill set or you built one, which is one to many. And I think, you know, I was passionate about marketing and passionate about Internet marketing. Like when I was a pharmaceutical rep driving around between pharmacies, I would listen to podcasts on internet marketing the entire time. So while every other rep was listening to music or just chatting on the phone when they’re driving between customers, I will be listening to podcasts and this was back in the day where you have to download them onto your ipod in order to listen to them and then I would listen on two times speed. So I would get through so many that I would run out of things to listen to and have to go hunting for other stuff. But yeah, I just, I was passionate about that. I just spent heaps of time learning about it and then I applied at wherever I could to try and make a bit of extra money. And I think I mentioned it in another video is that one of the websites I created at the time when I was a pharmaceutical rep, I would drive around and I would record podcast episodes into my phone because I didn’t have any recording equipment at that time. So I just use my phone. So do it like while I drive or like while I was parked on the side of the road, like after work I would quickly record an episode before going into the House before going home and that website other than paid to get that transcribed and then that website still makes me a hundred bucks a month, five or six years later because of work that I’ll put in on the side, the, you know, something that I knew a bit about but not. I wasn’t an expert in but I was better than the average person and so I created a website to help people about that. We’ve talked a lot about the money side of a aside business. Obviously you get a financial benefit on top of your wage, which really helps out week to week for cash flow or if you want to invest that into something else. But another thing that the side businesses gave me was purpose and a bit of meaning in my life. There was a reason to learn skills outside of my job and a reason to get out of bed. Like I used to get so excited because I wrote three blogs a week for like two or three, two and a half years before pumped on property, became what it is now, and I would go to work and I’ll just be so excited to see 5:00 because I could open up my personal laptop and creative blog that night and it was so exciting for me to be able to say like it took me a year and a half before I even made a dollar from that business, but it was just. It was so interesting to me to be doing something outside of my day job and to be tapped into this. I’m heading in the right direction. I don’t know how I’m going to get there right now, but if I keep doing the right activity, the right results will show up in my life over time. And they have. Yeah, and I think that’s the thing. If you don’t have a skillset that you feel like you could apply to a side business, choose one, choose one, and then go out there and learn and become better than the average person. And then create a side business from that or document the journey as well as another opportunity for business. But yeah, go and find an opportunity in the market. If you’re not good enough to then fill that, then become good enough like work on the side, learn on the side, listening to podcasts like this while you drive like we did Jay, like I still listen to Gary v stuff every week. Tim ferriss stuff most of the time I love tiny stuff that like my wife and I are big into Oprah’s soul sessions. Like you keep learning and keep growing. Like that’s what lots of outright. Yeah. So find some value in the market that you can offer to people in exchange for money. Get out there, start the side business. And then that’s where really where the wheels start turning and you start thinking about, okay, how can I grow this? Because until you started at. It’s all hypothetical and you don’t really think about it much, but once you start it and you have a business problem, like say you mow lawns and you’re like, okay, well how am I going to get clients that I can mow their lawn? Okay, well now you’ve got a problem that your brain’s going to work on and you’re like, okay, I’ll do letterbox drops and if that works great, like can you get some clients? Or if it doesn’t work, then you’re like, okay, that didn’t work. What can I jump on? Hi Pages, you know what I mean, like can I do next? But it gets you thinking and it gets you problem solving and then over time you build up skill sets around business and around marketing, which you can then take from the lawnmower business and apply to some other business and you can say, well, how did I get clients who lawnmower business? I did it this way. We’re like, let’s try that with this other business that I have. We actually do this right now, like, can we hypothetically, okay, I want to start a lawn mowing business. How would you launch it? How would I launch it and just like, I think this is the missing information, like there’s a lot of info on like why start a side business and then you’ve got a side business now what? But physically you know, like let’s talk about that. Like let’s actually pretend that we wanted to start a lawn mower and like what would you do man to start alomar run by the minimum equipment that I would need, which is a lawn mower and snipper probably and I would. So I would buy those or I would borrow them from someone I didn’t like either of them. Have you got a mate who has one? Can I borrow it? And I would do, I’d probably do a letterbox drop, like a pamphlet and do a letterbox drop. And then if people called me, I go around and quote on their lawn and then we’ve got a sale then. Right. And I will take the money from that to like buy my own equipment and to pay for petrol and stuff like that. And I don’t know. It depends how much work I’d want to do. Whether I would want to like reinvest into more marketing to get more clients or if I wanted to hire people to do jobs for me as well. Like yeah, like in my perspective, like in terms of the grind, I would borrow a laced someone else’s lawn mower because I don’t believe in investing in the equipment until you’ve got the cashflow to support it. I really believe in posh, like cashflow positive businesses from Taiwan, like I’ve never had a month in any business rep lost money because I don’t believe in it. I just don’t think you should lose money to hopefully make it in the future. Now that’s a backwards concept for scale. You can’t scale by doing that, but you know like if I was doing a lawnmower thing, there’s high pages in a task and now it’s. Well Gum gumtree where you can immediately find people that want your work. You can jump on things like sunny coast stuff for salaries, Sydney stuff aside and work those channels and then I would just go straight to. What I’ve learned is I would go straight to influencers. Who are the people that need loans made property investors and high madison wealthy areas who looks after those people. It’s effectively an accountant or a property manager and I’d use that one network to get into like 200 people and then I would just build a relationship with that one person. So I only really have one client and then the property manager has the actual relationship with the owner. So I’m invoicing one person and I can get scale from just that and then I would replace myself out of that role as soon as I could with that one relationship. And I started secondary relationship work my time until I could replace myself again. I was just thinking an idea that I would have. It would be like I would get a bunch of lawn mowing jobs and I would do the jobs and get them as regular clients like once every four weeks or whatever. And then I would basically sell that Gig to someone else to say, well, I’ve got this job that pays $100 bucks a month, like once a month or 100 bucks. Like do you want that job? So for 500 bucks or so, whatever, I’ll never going like, you know, even if you sold it for $100, you’re making $100 out of nothing. It’s really interesting. You know, I just had that idea. Then I’m not actually going to go out and sell online business, but that could be maybe had it and I would only do it if I had someone good to pass it onto that I knew did a really good job. I wouldn’t pass it onto someone who would do a crap job. The service relationship. Yeah. But then all of a sudden turned a lawn mowing business into marketing business where you’re selling leads for what you’re selling contracts, lawn mowing contracts, not contracts, but you know, ongoing, ongoing work. And so then I would have a marketing company which is kind of what I have now. So I’d be like taking the skill set that I have now and applied that to a well known business. Just, you know, what skills do you have right now in your life as you listen to this that you could immediately apply? 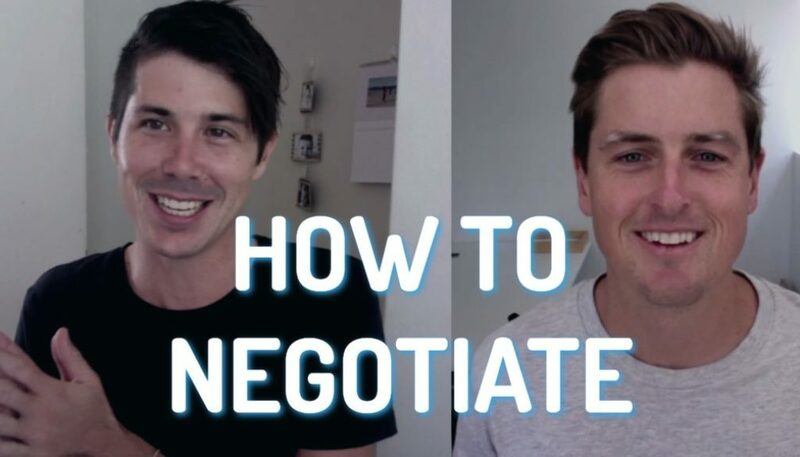 Like, Gee, you have project management skills, management skills, leadership skills, sales skills, marketing skills, how can you find a little niche which is profitable, where there’s low cost barriers to entry that you can really start getting something on the side from today and it’s so easy, man. Like when you start thinking about all the different ways with the skills that people have, you know, like years ago, just an if got that, get up and go attitude type thing and just realize that it’s not going to be perfect. You’re actually just going to have to make a mistake, problem solved and mistake making another one and then that becomes a system or a process which you can scale. Then that is, that’s where it’s at. You know, or even you could use like the lawnmower business as a stata or some sort of side hustle where you’re going to garage sales and buying stuff and selling it. You could use that to build up enough money to then buy USB sticks from China or whatever it is you want to do. Like if there’s a business that costs more money to get started where you have to buy inventory because you’re going to sell it. Um, you know, you could use a side business to get enough money to start another side business. Like you don’t have to just do one, you can use one to leverage into another one or you can use the side business to then invest in property, get passive income from the property. The thing about investing that’s crazy, there’s just this one taking off on the water behind us is like a planet. It was Thailand, um, is that one thing leads to another and once you start taking action and solving problems, opportunities present themselves that you could never have seen before. Like I knew that doing the government grant stuff wasn’t going to be what I wanted to do after doing the first one, but I use the second one to build relationships with 20 new businesses. And then I went and got insurance 10 ships to those businesses and then ended up earning over 200 grand a year within a couple of years out of uni from working for one of those businesses that I’ve built that relationship with. Like there’s so many different ways that life gives you opportunities if you’re looking for them. But you’ve got to start somewhere and then build off that. And even my business now could help me get a job. If I needed a job, I could walk into someone else’s business and say, look, this is what I built a pho. Everyone wants Ryan skillset. But that’s the thing. Yeah. I built up a skillset now that if I was competing for a job, I could say, well, here’s what I’ve done. I can walk into a business and say, I’ll do this for your business rather than just applying to an ad on seek or wherever they advertise jobs these days. I could walk into multiple businesses and say, here’s what I’ve done. I can do this for your business. Here’s how much I want. And I could walk into 20, 5,100 businesses and probably find someone to hire me because of my skillset rather than waiting for a job is like even in my job when I was doing that side hustles, I was learning so much from those skillsets about negotiating, selling delivery that I was able to walk back into my boss’s office and renegotiate everything about my contracts like violent. Really quickly. That being an employee a when when there’s no bonus or commission relied incentive to the role. And I’m talking about man I had, I had bonuses tied to when I worked in hospitality like all the way back then. Like I realized really, really quickly that having a small base salary is good for a boss because there’s little risk with lots of upside for you and him if he performed. And so everything I negotiated down to that is give me the minimum below anyone else but it gave me an attachment to profit share and I’ll smash it for you. And that’s what I focused on doing. And I only learned that stuff in the side hustle or the side business. And that’s the thing, my side hustle and my side business took time, like it doesn’t happen overnight, so I still worked and I still applied those skills to move up the corporate ladder while I was working in my business on the side and then eventually jumped into business full time and made that leap and then hopefully you guys can get there too. But even before I made that leap, my side business was helping me with my skillset is helping me earn more money in my job and I was earning money on the side as well. So certainly something that’s worth trying. Something that you can do with little risk of losing money apart from your time if you do it wisely and something that I think a lot of people should go out and try and give it a like trying to make a little bit more money and having a bit of fun doing it. Yeah. And if you can make extra money, it can really accelerate your goal of financial freedom and help you achieve it way faster. And who knows, maybe you’ll be sitting right here next to us in two years time saying that, yeah, you quit your job and you’re now financially free through your business or your businesses earning good money because you watch this video and you started side business. So that could be you if you go out there and take action. So I think action steps I would recommend for people is just write down a few ideas that you have for how you could make some money in a side business. You don’t necessarily have to go and do it, but I think just get the wheels turning in your head as to what could I do? I just got the best idea for a side business for what I’m going to tell you on camera, but I’ll tell you off. But you know what I mean? Like the one, there’s so many opportunities. Every time we hang out you’re like, I’ve got this idea, I’ve got and I’m like, good for you. Then you’re like, let’s do it. I’m like, yeah, no, it is a cheap tom say commodity. But yeah, like it’s exciting to talk about different ideas, man. I think it’s human nature to want to explore things, to want to grow into wonderland and beside businesses, the financial way to actually fast track that learning. Yeah. So go out there, right? Some ideas. If you’ve got ideas and you want to share them in the comment section below, then do so we would love to hear them and hopefully we’ll hear from you in six months, a year, two years that your side business hustle is going well and you’re making some money. Thanks so much for watching. Guys. Check out this other video that we did, which I will leave in the links down below, or you can click it here on youtube. Don’t forget to like and subscribe as we new content coming out every week. Until next time, stay positive.